Topical Stamp Collectors Love Our Approval Service! Look at these topical stamp examples! Are your favorite topicals here? If you’re a topical stamps collector, look no further! Our Custom Approval Service will bring selection after selection of all your favorites…right to your home! Flowers from New Caledonia, Papuan native headdresses, the fascinating wildlife of Lesotho, Tristan da Cuna ships, tropical Indonesian fish, penguins from Antarctica, a Princess Diana issue from Fiji, 19th century "stamps on stamps” from Nauru… and many more. 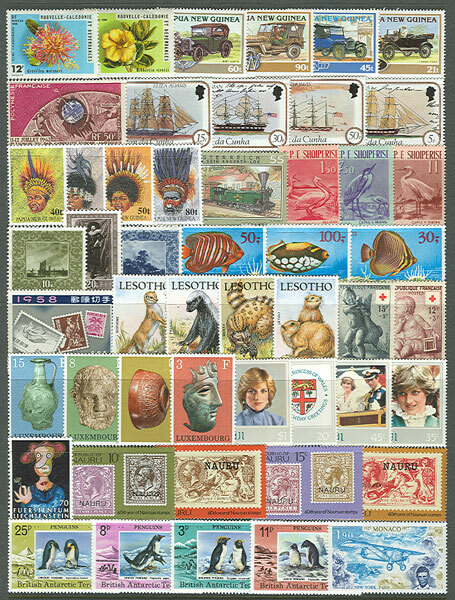 We can supply all major topical stamp categories…what are your favorites? Tell us by requesting a custom selection. This scan represents just a fraction of the type and quality of stamps you can expect to receive in just one of our Custom Approval shipments! And, since we specialize in complete mint sets, you’ll receive the entire set – including all the scarcer high values…not just an incomplete or "short” set. Our inventory is constantly changing, and as one of our Approval clients, you'll receive stamps on approval that match your own particular collecting interests. Over the years, thousands of collectors have built spectacular, valuable collections of quality stamps using our convenient time-saving "shop-at-home” approval service. Why wait any longer? Request one of our custom selections NOW!